Trekking in the spectacular Langtang Valley is the closest you could get to the massive snow capped mountains from Kathmandu valley. The Langtang Valley is located only 19 miles north of Kathmandu , close to the border of Tibet . 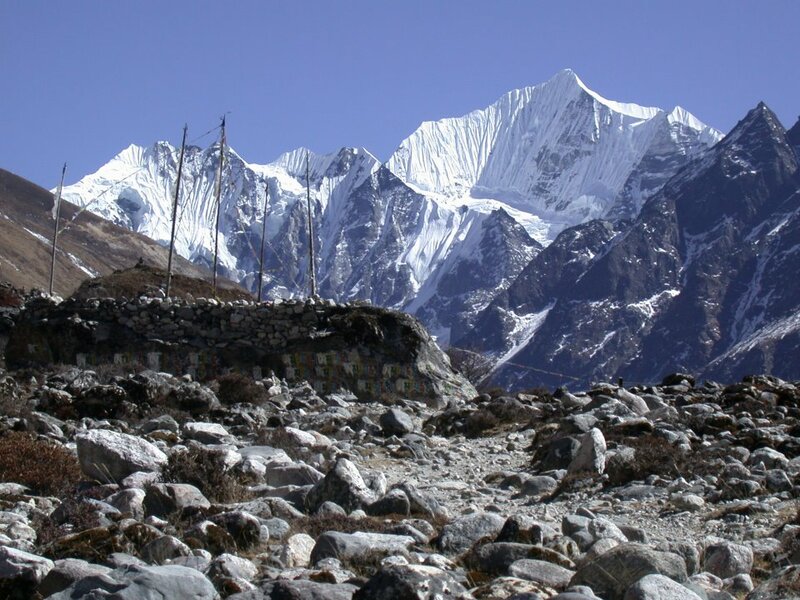 The valley is dominated by Langtang Lirung [7246m], the highest peak in the area. This is a superb introduction to trekking in Nepal among some of the most beautiful scenery in the whole country. This Langtang trek towards the base of Langtang Himal, north of Kathmandu valley, offers the shortest approach to snowy mountains from Kathmandu . The Langtang trek starts from Syabru Besi after a 9 hrs drive from Kathmandu . Following a trail upstream Bhote Kosi river through ethnic Tamang villages, lush green forests and the wide spread Kyangin valley surrounded by snowy peaks from all fours sides, takes you up to Kyangin at 3800 meter, where you get an opportunity to ascend Kyangjin Ri [4350m. ], from where the 360 degree mountain views are truly panoramic. After an ascent of Kyangjin Ri , we retrace our route back down the valley to Syabru Besi and then drive back to Kathmandu . Due to gradual ascent along the river valley this Langtang trek is not considered strenuous, but yet, it remains challenging as it reaches an altitude of 3800 meter at Kyangjin. The Langtang trek can be done any time of the year except during monsoons. This is a moderate trek that involves approximately 6 to 8 hours of trekking on up and down well marked trails. After Langtang village, the trail uphill to Kyangjin is easy. No previous experience is required, you should be moderately fit, used to some regular exercise and enjoy walking in the high altitude conditions.